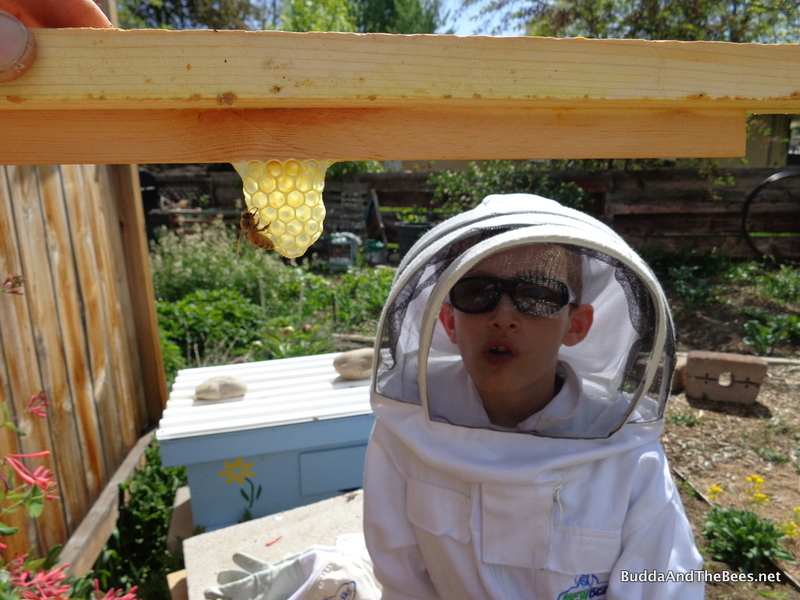 It’s been over a month since my last post which I know has had some of you wondering if I’m still blogging or beekeeping. 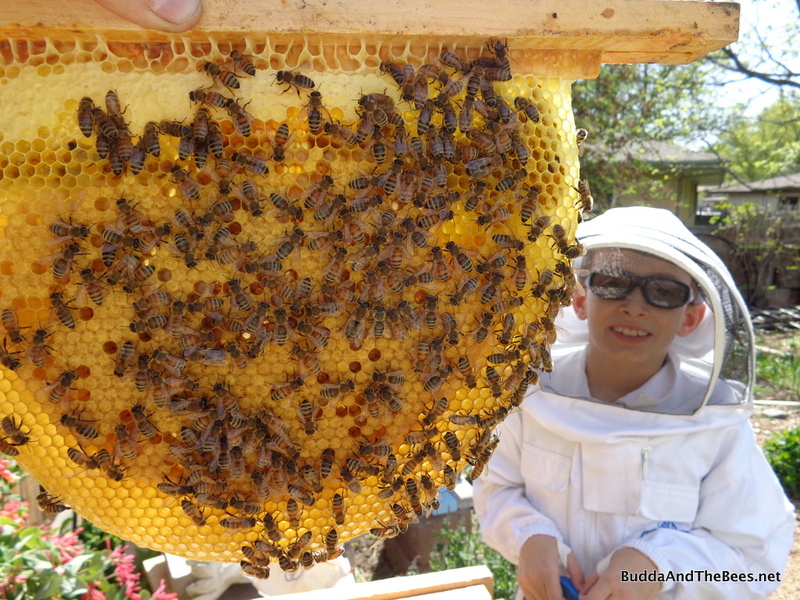 There’s a saying in beekeeping – you can either make bees or make honey, meaning that if you spend a lot of your beekeeping efforts raising new bees by doing splits, etc, the bees won’t be able to make honey. I think the corollary to that is you can either tend bees or write blog posts (especially in the spring). I’ve gone from one hive to 7 this spring and only 3 of those are in my backyard, so it takes more effort to check on the out yards. 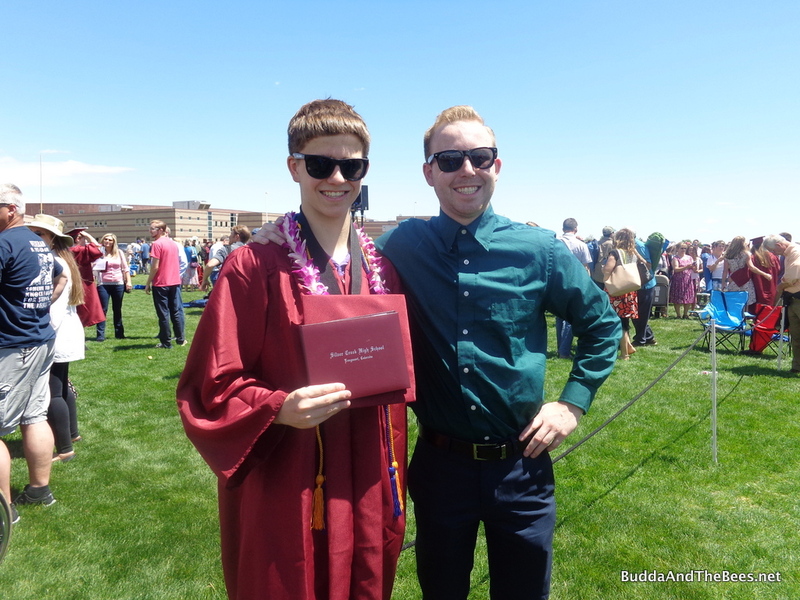 Between that, rainy weather that put me behind on my gardening and my youngest son’s graduation from high school, I haven’t had time to sit down to update the blog. But things are settling down in the bee yards, I finally got my vegetable garden planted and Patrick’s graduated, so I feel I’m coming up for air. Back in early April, I split BnB2 into BnB1. (My friend Julie, over at Happy Hour at the Top Bar, just posted a nice summary of different ways to do splits. 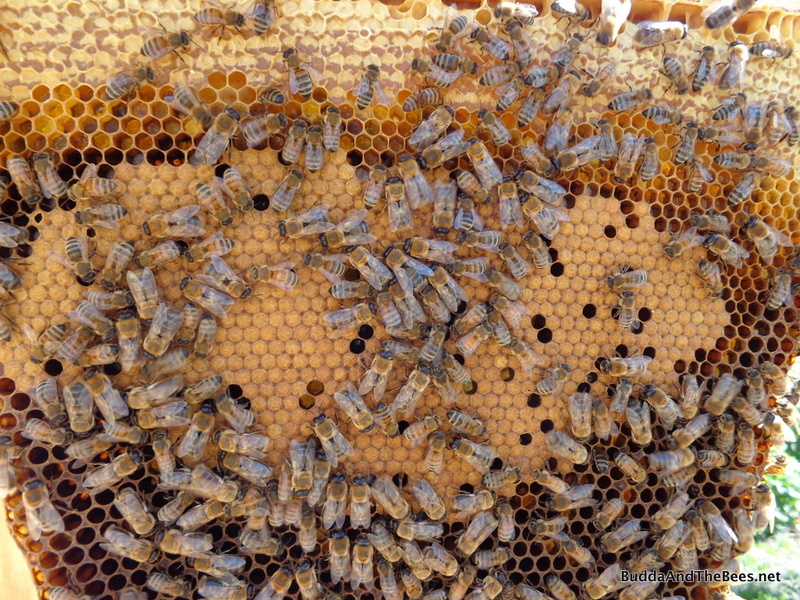 I used “Method 3” – move the queen and some brood and bees to a new hive and let the old hive raise a new queen.) Well, much to my chagrin (and lack of experience), they raised too many queens and BnB2 swarmed with one of the virgin queens. I caught that swarm and put it in a little mini hive that I’m calling BnB3 for now. 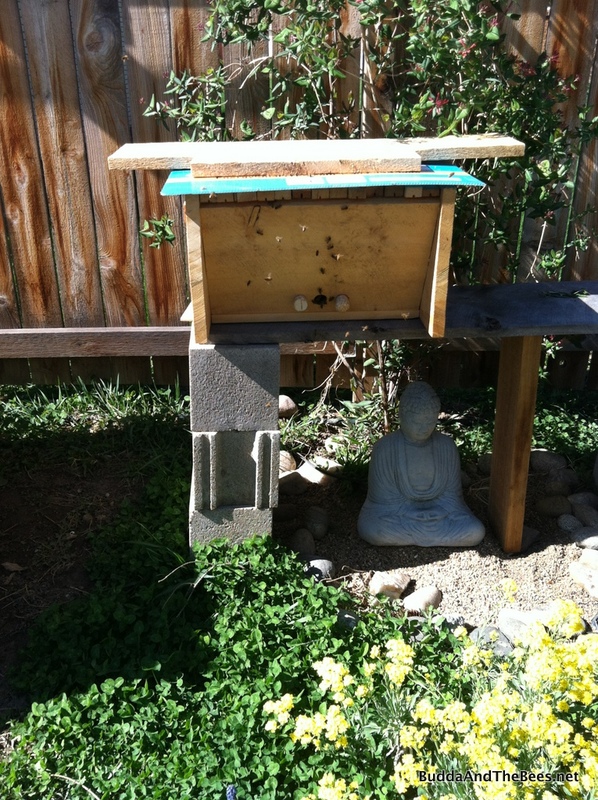 I did a bit of rearranging in the bee yard, and it’s in a temporary position, keeping the rain off Buddha. I plan to make a more permanent bench that will hold two 12 frame nucs, but that’s just one more thing to do. Both hives seem to be doing well except that BnB2 has too many drones in my opinion. Before I did the split, BnB2 had lots of capped drone brood in it. I probably should have removed some of it but hindsight is 20/20. Drones are needed mostly for one thing – to mate with queens (but not their own sisters). Otherwise, they are just a bunch of lazy couch potatoes – hanging out in the hive, eating everything in sight when they are not out trying to hook up. BnB2 has not been building up very much nectar and honey and I think it’s because the drones are eating up whatever the workers are bringing in. I have about 3 combs in the back of the hive where the honey usually is located that are covered with drones every time I look in. I’m hoping that the drones die off soon, or the girls get wise and kick them out of the hive so they can build up honey and nectar. Neither of the queens seems to be laying many new drones, so once these drones are gone, I think the honey buildup will begin. Plus, we’ve just entered into some nice weather, so I think there will be plenty of nectar coming in soon! Let the honey flow begin! Love all the photos. You’ve got a couple of handsome fellers, and they look like great brothers, too. So glad to hear that everyone is queen right. Hopefully, you’ll get some honey soon, too.